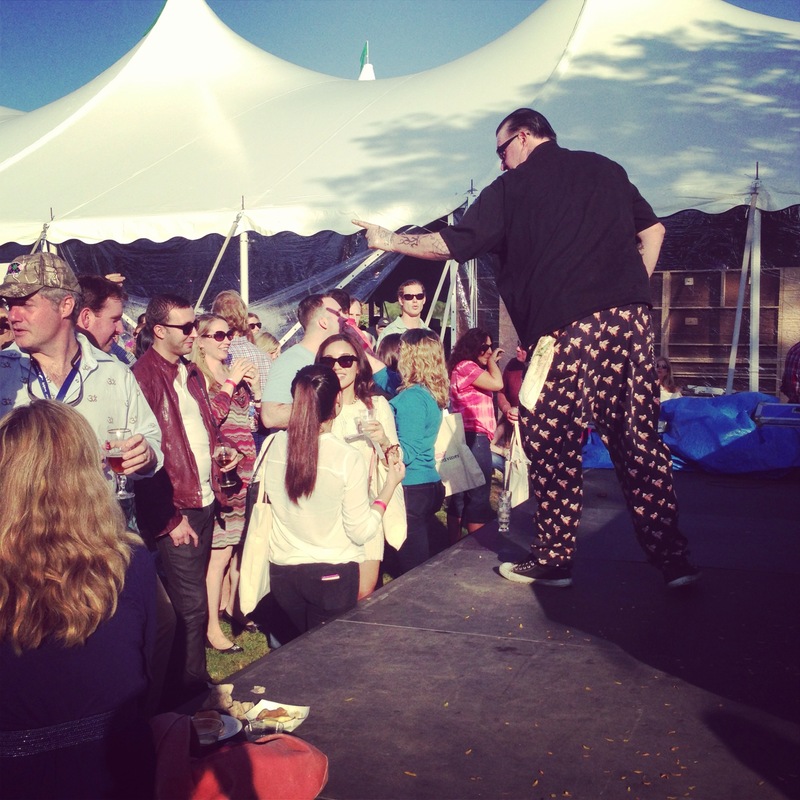 Last Saturday, we left the comfort of Westchester for nearby Greenwich, CT to attend the 2013 Greenwich Wine & Food Festival presented by Serendipity Magazine. 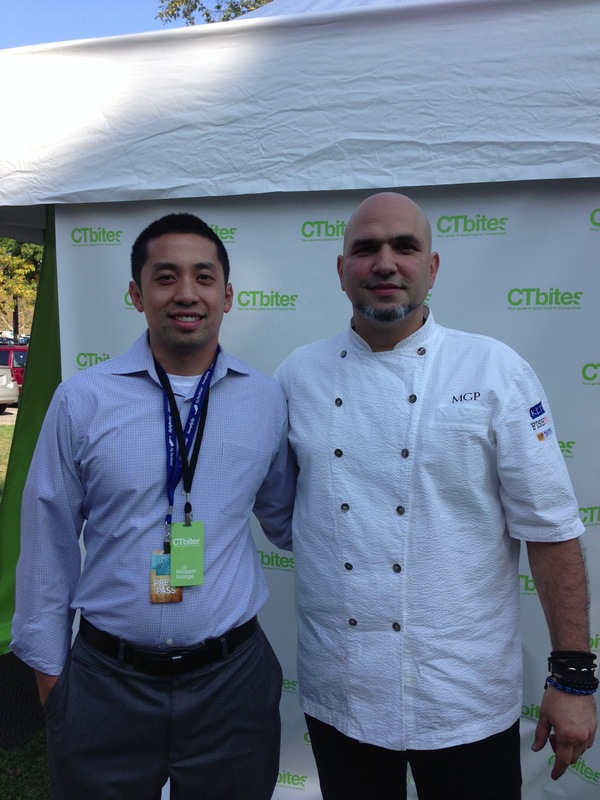 It was great day to be at Roger Sherman Baldwin Park as we met celebrity chefs, fellow bloggers and local business owners. And oh yeah… we also ate some delicious food! We made our way to the Culinary Village with empty stomachs ready to eat. Boy, we were not disappointed! From grape leaves (Elia Tavena) to Octopus (Char Restaurant) to Indian food (Saffron Indian Cuisine), we ate until our stomachs were full… maybe a bit too full. Fortunately (or unfortunately) for us, the tent was packed to capacity so we weren’t able to stop by each table… on our first go round, that is. Fortunately, we were there the whole afternoon and had the chance to make a number of rounds through the main food tent. Luckily, we were able to give our stomachs a chance to settle as we explored the area around Culinary Village. 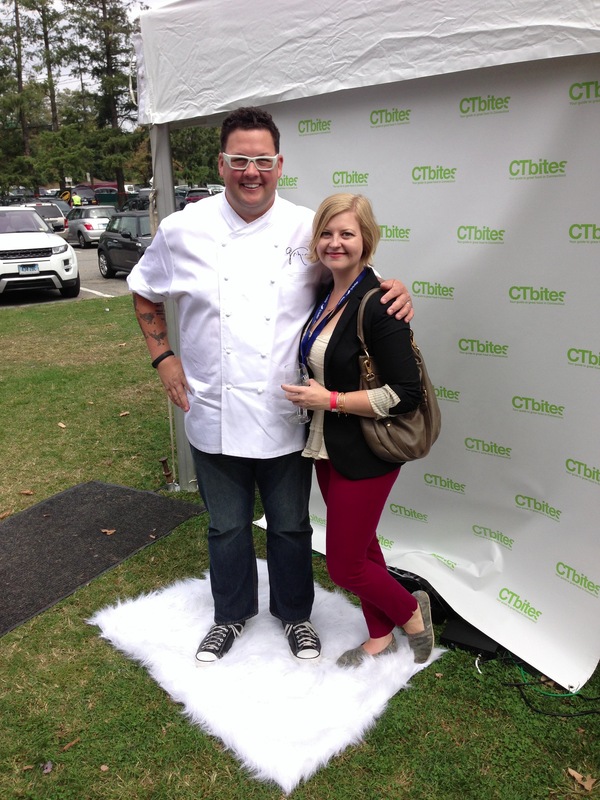 Courtesy of the CTbites Bloggers Lounge, we listened to chefs including Dale Talde, Graham Elliot, Michael Psilakis and others share their own personal stories and answer questions from the audience. We now know that Chef Dale Talde keeps Nikes in his oven! We’re both fans of his cooking and now Allen is a big fan of his shoe game as well! 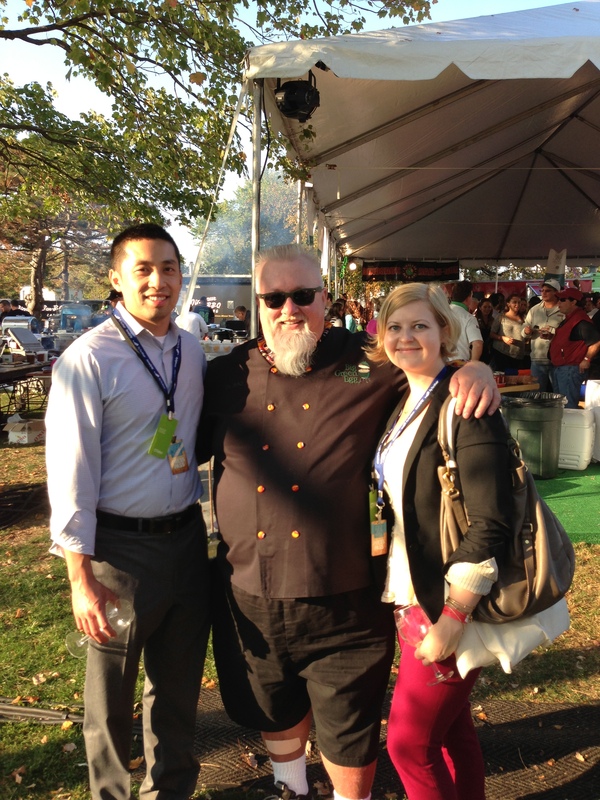 Of course, we couldn’t turn down the opportunity to take pics with some of our favorite chefs! 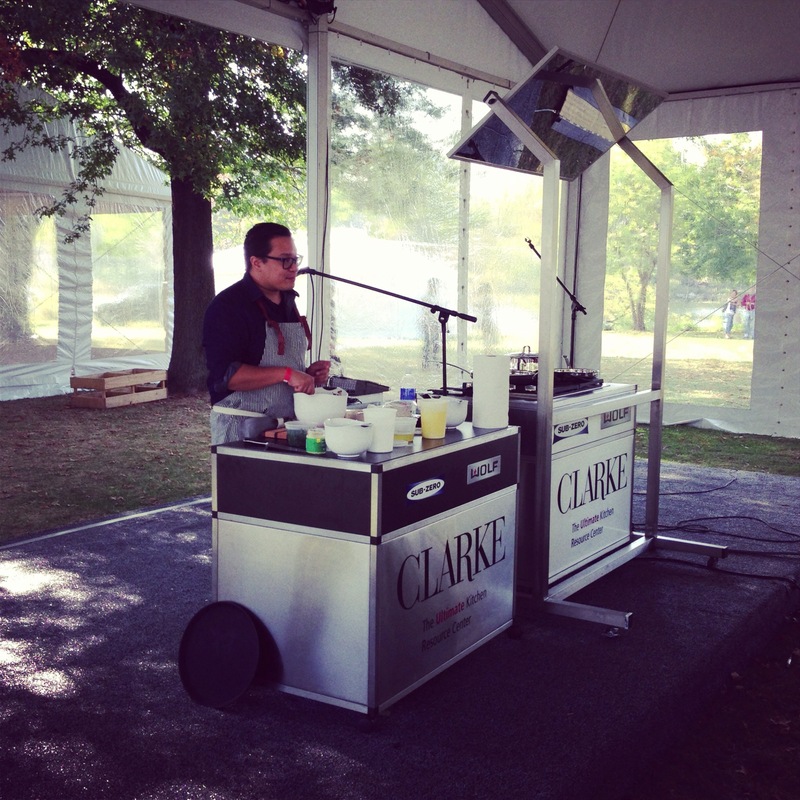 In addition to the CTbites Blogger Lounge, we watched chefs display their culinary talents and share some wisdom under the Culinary Demo Tents presented by Clarke Kitchens. Chef Michael Psilakis shared the virtues of cooking with extra virgin olive oil and we also learned how to make dim sum from Chef Talde. 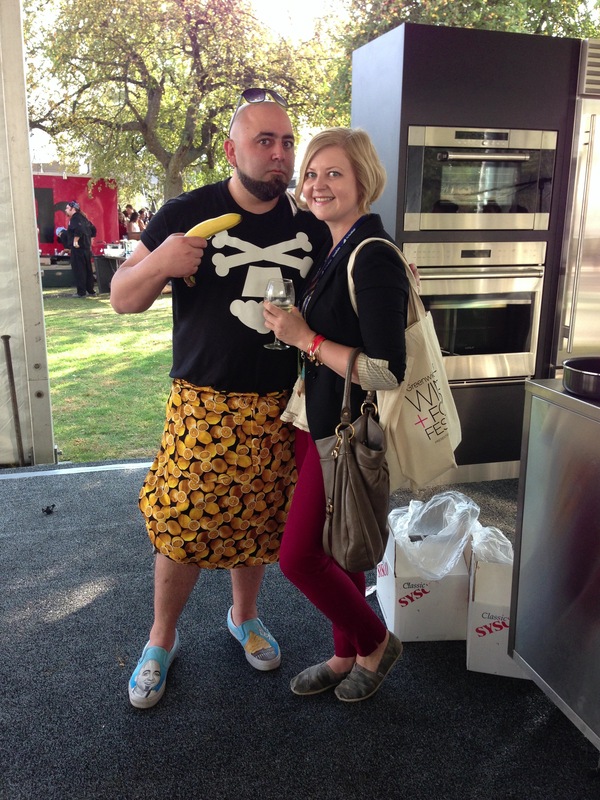 We can’t forget laughing through Duff Goldman’s presentation– and learning at the same time, of course! 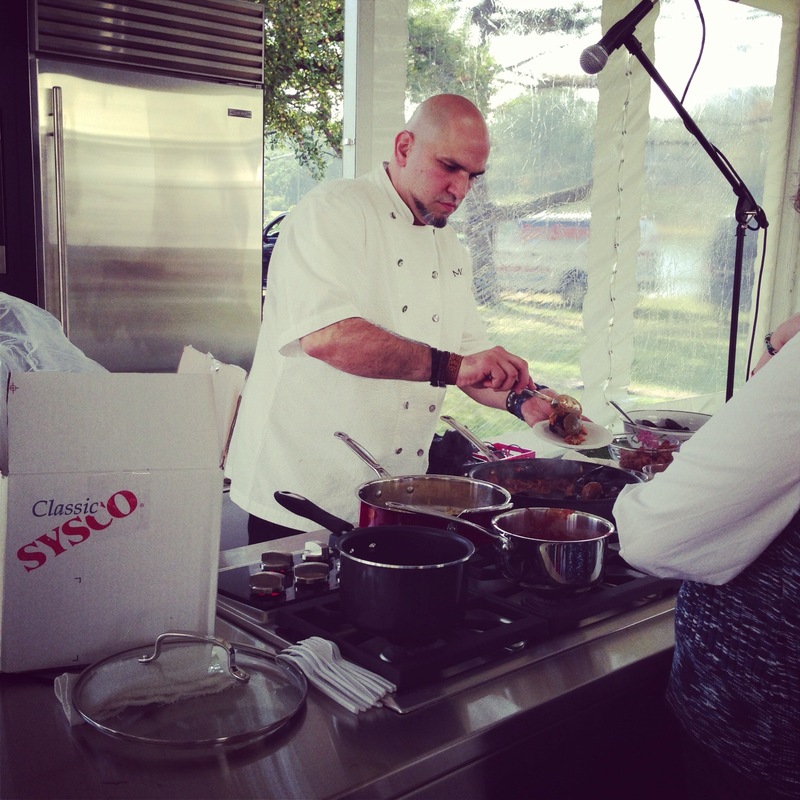 Chef Michael Psilakis serving the crowd. Once our stomachs were a bit less full, we made our way to the Burgers, BBQ and Beer tent. There, we tried burgers from Shake Shack and BBQ Ribs from Bobby Q’s. We also watched Pitmaster Tim Doherty serve the crowd slices of meat… it looked like a rock concert as he reached into the adoring (and salivating!) crowd! The highlight of hanging around the tent area was meeting and talking briefly with Dr. BBQ also know as Ray Lampe. We learned that he is a big fan of baseball and roots for his hometown team, the Tampa Bay Rays. 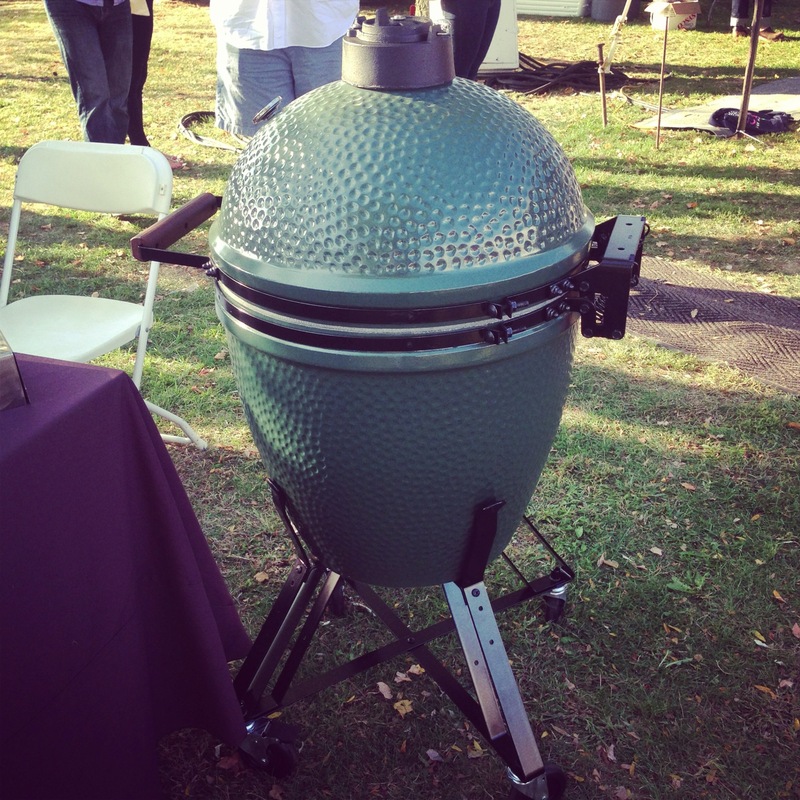 We were also pretty excited to finally see the Big Green Egg in person! The Big Green Egg up close and personal! Listening to chefs share their stories, watching chefs displaying their culinary talents, eating everything (and we mean everything)… you could not ask for a better wine and food festival! We thank Serendipity Magazine and Shelley Kapitulik of Splash PR for inviting us to such a great event. Also we would like to thank Stephanie Webster and the CTbites team for access to the blogger lounge and most importantly, having the charger station nearby so we could keep our phones working throughout the day! We hope to be back next year! I am SO jealous that you went to this event! I live in the Hartford, CT area, why didn’t I know about this?! Next year, for sure! Looks like you had a great time. Love the post!